The National Chamber of Pharmacists is an institution encompassing all pharmacists carrying out their profession in Metropolitan France or in the overseas départements and collectivities. The National Council of the Chamber of Pharmacists is the custodian of professional legality and integrity (Article L.4231-2 of the Code de la santé publique). It is qualified to represent pharmacy, in its field of activity, with the public authorities and assistance bodies. It may exercise all rights reserved for civil actions before all jurisdictions relating to circumstances involving a direct or indirect prejudice to the collective interests of the pharmaceutical profession. It organises the implementation of the Pharmaceutical record. 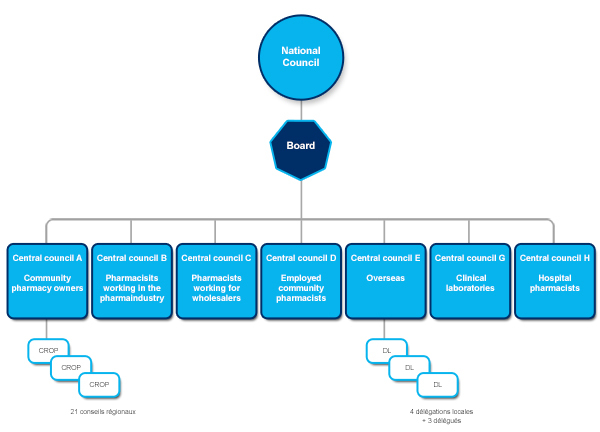 The National Chamber of Pharmacists has the structure of a National Council with seven sections, each managed by a Central Council. Each section represents one of the pharmaceutical professions, with the exception of sections E and D.
The regional Councils of section A and the Central Councils of the other sections fulfil both administrative and jurisdictional roles. The elected members of the Councils have a mandate of 6 years. Councils are renewable to the extent of half their members every 3 years.